Moving to the Cloud – What’s the impact on your Licensing? Cloud service providers like AWS and Azure offer many advantages to the Enterprise, including OPEX operating models, flexible commercial terms and elasticity in computing. In the era of BYOL and License Mobility if you're planning to migrate your existing licensing agreements over to these IaaS environments, you run the risk of eroding your planned savings, creating a suboptimal licensing environment and in the worst case becoming non-complaint. 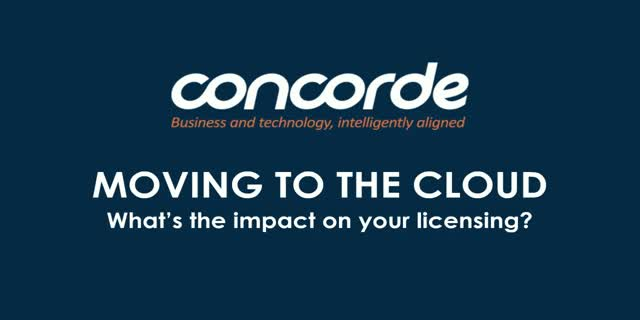 Hear how Concorde has helped leading enterprises gain the visibility and insight to plan for, migrate and manage their licenses to the Cloud and delivered the benefit of Future of Software Asset Management to the IaaS environment. Title: Moving to the Cloud – What’s the impact on your Licensing?